Aztec Solar Calendar, Aztec Calendar, Aztec Art, precolumbian reproductions, mesoamerican reproductions, solar calendar, calendario azteca, calendario solar azteca. Antropological Museum, Mexico City. 1500 A.D. The Aztec calendar set out the mathematical formulas according to which the whole universe was organized and which governed the actions of men and Gods alike. 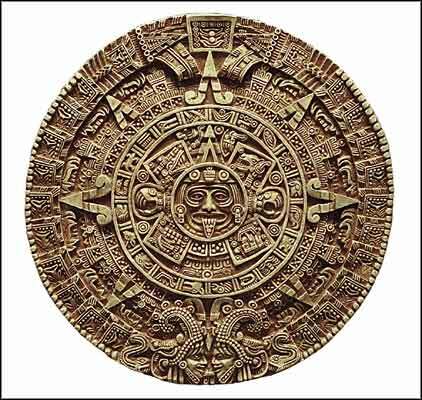 The calendar is actually two: the Xiupohualli or the count of the days and the Tonalpohualli or the count of destiny. The calendar had to be consulted through the priests before engaging in any activity whether it was farming, warfare, religion or commerce. In addition to the count of the days, it also has astronomical data like the phases of the moon and Venus and the years of Mercury and Mars. The calendar also mentions the four eras of humanity known as "suns" before our own: all ended in cataclysm. The sun that is now ours, the fifth one, Nahui Ollin ("four earthquake") is supposed to end by cataclysmic earthquakes. The Aztecs attributed the invention of the calendar to the God Quetzalcoatl. The calandar weighs 25 tons and has a diameter of eleven feet.